Hold on; it gets better! The words translated "longs" and "wait" are the same Hebrew word in the original text. Longing is a part of the wait! It is not a sin for me to ache for the child I do not yet have! The Lord aches to give me that blessing! I must wait, but I can long. The Lord longs to bless but waits to do so. When He waits, there is always a reason, but He feels the ache! I cannot tell you what freedom this brought me. I sat on the couch, alone in my living room, and sobbed tears of relief. God is so gracious. I had no clue when I typed those paragraphs in my blog on June 25, 2014, what the Lord had planned for my family. Donny and I were in the middle of a fierce battle with infertility, and I wrote that as we waited for the results of our second intrauterine insemination (IUI). We had tried to get pregnant on our own for five years. When we were unable to conceive, we were referred to the Alabama Fertility Specialists in Birmingham. At the time, we lived in Leeds, Alabama, so it was a short 30-40 minute drive. Mom always joked that we were “from good Kentucky stock” that very easily got pregnant. I was under the impression that our infertility treatment would be pretty short because the women in my family had never had trouble conceiving. I thought that we’d need maybe one or two IUIs, and then we would welcome a perfect, chubby baby in nine months. That was not the Lord’s plan. His plan was far beyond what I could have ever imagined. As the months passed, my emotions ran the entire gamut: cautious excitement, disappointment, fear, depression, anger, and resignation. I decided to go for a walk, a long angry, stompy walk. I walked to the park and started around the track. If I'd been in the middle of nowhere, I would have ugly-cried the whole way, but I was sharing Leeds Memorial Park with several joggers and strolling seniors. I argued with God, or more like fussed at God, as I sped around the track. 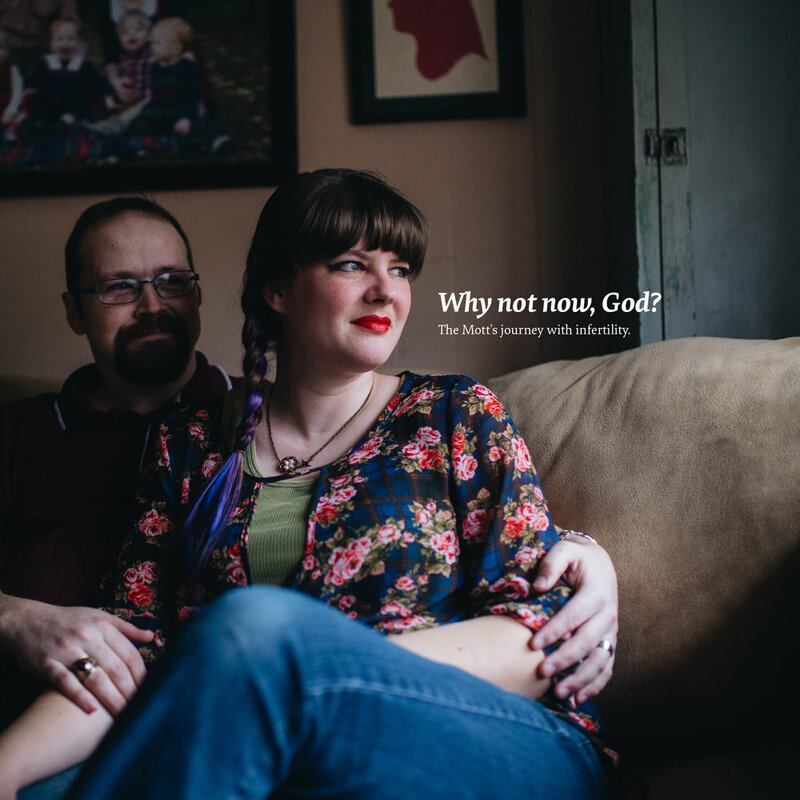 I threw every reason at Him about why I should be pregnant after this attempt, wrapping up my brilliant tirade with, "why not now, God? Why?" The angry child pounding her fists on the chest of her King turned into a weeping, exhausted woman in the arms of her forgiving, understanding, loving Lord. I sat down on a rock outcropping and continued to cry out. The anger didn't vanish by any means, but I had permission to talk it out. God understands. He allows us to hide in Him and cry out our anger, frustration, and broken dreams. I'm still far from ok; I'm broken. But God understands. He has a plan. This was not the time. We went in to see the Alabama Fertility Specialists on November 10, after several days of injections at home, for our sixth IUI. I was having a very hard time being positive about this attempt after the months of failures. As I lay on the table after the nurse left the room, Donny grabbed my hand and prayed over me and the procedure, for our “one day children,” and for God’s will to be done. Two weeks later, we had our follow-up bloodwork and appointment. On our way out, Karen, the precious nurse practitioner who had walked with us through our time at the clinic, asked, “When we give you a positive result, can we take off Hawk’s vest and play with him?” That lightened the tension. Hawk is Donny’s diabetic alert dog. He goes everywhere Donny does, so he had been at all our appointments in his “service dog, do not pet” vest. We laughed and promised a puppy play session in the office when we got a positive pregnancy test. Then we headed home to wait until we got the call about our lab results. "Hi, Leigh! Tell Hawk to get ready! Your whole fan club is here in the office to give you the news. You are so pregnant!" Karen chirped over the receiver as a chorus of excited cheers erupted in the background. All I could do was ask “really?,” grab Donny around the neck, and sob. We held each other and wept, but this time it was tears of joy. I was fixed on that screen, watching my babies. They were just little dark spots, but Karen pointed out little flashing heartbeats. Heartbeats! At six weeks, my tiny babies had beating hearts. I was suddenly very aware that my body now had five heartbeats. Every mom of higher-order multiples (triplets or more) has heard the next words that came, “selective reduction.” Each additional baby that a mom is carrying generally reduces the expected gestation by four weeks, meaning that carrying all four put the babies at risk for being delivered so early they would not survive or that my life could be put at risk. It was never a choice for us. Those four dark spots with little flashing heartbeats were our children. God placed them there. God made me their mother. He ordained it. I was here “for such a time as this,” yet we kept hearing “selective reduction.” We heard it again 30 minutes later from the doctor in the exam room and again when we saw the maternal/fetal specialist two months later. Then, it would make my stomach hurt each time I heard it, but now it is completely unthinkable. Which two of my children would I not have? Georgie? Merril? Dorothy? Molly? They are all incredible little people who have blessed my life beyond measure. Carrying quadruplets was undoubtedly a challenge. My world revolved around food, trying to keep said food down, and rest. I was a third-grade classroom teacher, not exactly a restful job, but my peers surrounded me with support. They walked my kids to lunch and buses. They ran my copies. They prayed for me and my babies. I was able to teach until spring break, then I was put on home bedrest at 22 weeks gestation. My cervix was funneling, and I had to focus on just growing babies and rest. At 24 weeks, I started preterm labor and was admitted to the High-Risk floor of Brookwood Women’s Center. Thankfully, things calmed down and I stayed at the hospital for the rest of the pregnancy. On May 5, 2015, at 27 weeks gestation, my Mottlets made their grand entrance in a very crowded operating room. They were welcomed by Donny, me, and 25 medical professionals. I held my breath and prayed for them to cry out. Only one cried. They were quickly attended to by teams of neonatologists, respiratory therapists, and nurses. I caught quick glimpses of tiny hands and feet as they were wheeled by my head on the way to the NICU. Georgie was the first born and our biggest. She was 2 lbs 3 oz and was the one that cried when she was delivered. She went on CPAP and was never intubated, which was such a miracle. Merril was second and our smallest and most impatient. He was supposed to be delivered third but tried to push out as Georgie was delivered. I vividly remember my OB saying, “Woah! Wait, Merril!” He was only 1 lb 10 oz. He struggled with breathing and required a long time on both standard and high flow ventilators. I didn’t get to hold him for over a month after he was born. Dorothy and Molly tied for middleweights at 1 lb 13 oz each. They both had to be intubated and required standard and high flow ventilators at different points in their NICU stay. Molly had the hardest time. She had an unidentified infection that required her to receive extra antibiotics, undergo a spinal tap, and be taken off feeds for ten days. The NICU became my second home. I would go with Donny when he headed to work. He would drop me off at the hospital and pick me up on the way home. The nurses and doctors that cared for our babies will always be a part of our family. Georgie lived in the NICU the first two months of her life, then was released to come home. A month later, Dorothy followed. Then Merril joined us a couple of weeks later. Finally, Molly was discharged a few days after that. We were finally a family under one roof. It was such a relief and so terrifying at the same time, to have these four tiny babies under our care. If you are currently walking through infertility, we want you to know you are not alone, that we are here, and want to walk with you on this journey. We have a Female Only support group that meets on the first Sunday of the month at 3:00 pm on the 2nd Floor of the Children's Building in room 211. No childcare is provided at this time. If you have questions please go to fbcstarkville.com/infertility.